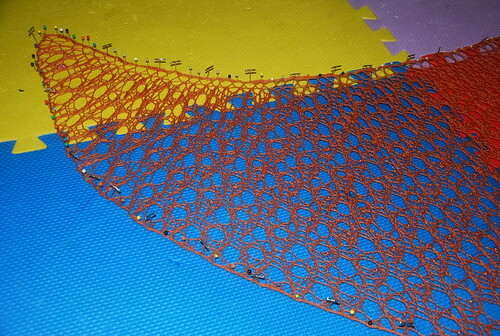 Fresh out of the blocking pins is my Lacymmetry shawl reveal. 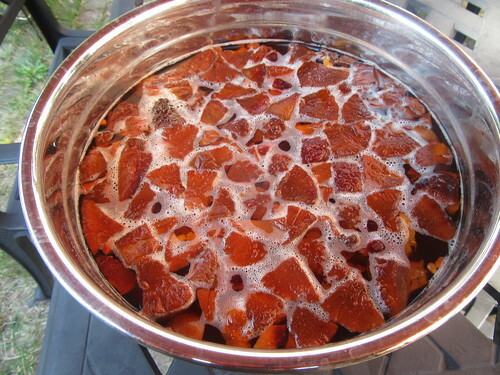 It’s come through an antique flax wheel, madder dye bath, and knitting with 4 posts here on the Knit Knack, phew! Wireless headphones on during Ty’s ‘quiet time,’ and I was smiling along to Béla Fleck & Abigail Washburn’s music. More solid FO pictures may yet happen but this was a busy weekend and now we are getting our roof replaced. The dots of shine in the larger lace holes (double yarnovers) are the gold 8/2 Miyuki beads that I mentioned in my post last month. In this design they are on 1 side of the asymmetrical triangle. 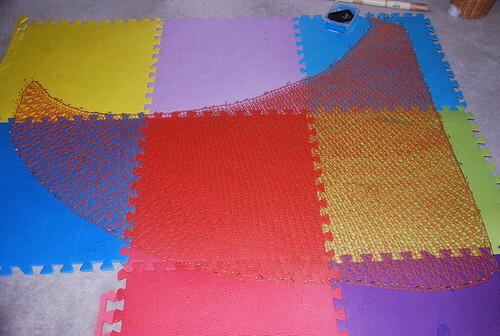 While still pinning the wet shawl on my mats, Ty came in, approved & added, “… it’s just like a pizza slice!” Kiddo sees negative space as pattern! The beads are the cheese, and the big holes are the pepperoni. Project is forever to be a.k.a. 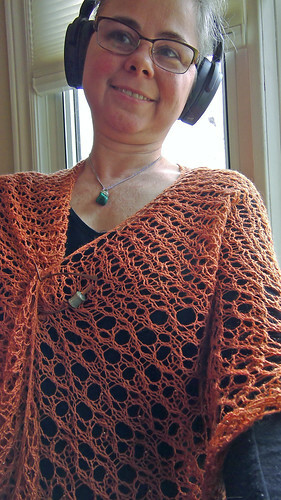 irieknit’s Handspun Lacymmetry aka Pizza Slice shawl. Creative licence says it’s a wearable pizza slice and who are we to argue? In the last beading stitch, I used a ceramic starfish. It is pink and sits to the upper left of this image. 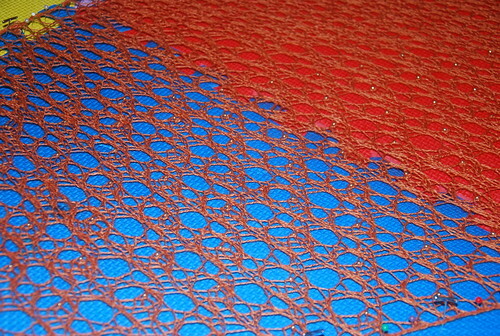 It took around 1.5 hours to secure the wet shawl in this hard blocking. The triangle type is different from the pattern sample for 2 reasons. First, I ran out of yarn with more than the recommended stitches remaining to the left of my marker. Those vertical stripes changed things. Second, I blocked for depth and did not match the pattern’s schematic. Blocked to this obtuse type of triangle my Lacymmetry is a similar width at 61″ and much deeper at 49.5″ compared to Naomi Parkhurst’s sample. I used all of my yarn at around 646 yards. The pattern sample uses less at 610 yards. A shimmer of gold beads, why not? 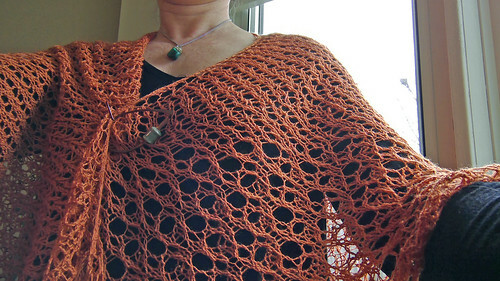 Working with one-of-a-kind handspun also changed the ‘pepperoni’ side’s edge. In the grips of yarn chicken, I did a basic cast-off. It is straight and not scalloped as a result. 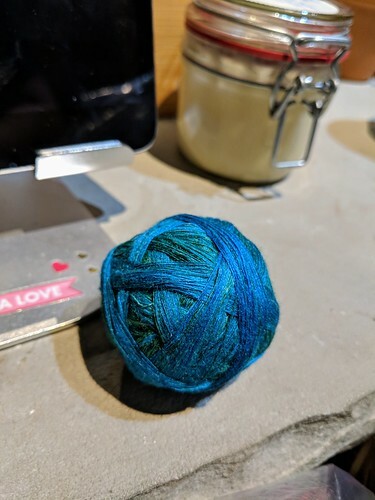 A little over a half of the Mother of Dragons BFL yarn (mid-September 2018 TKK post in link) is for a bouncing baby boy cousin. With 3.5 mm needles, I had 5 stitches per 1″ of garter. It was a big decision to use this yarn. Knitting a gift is a personal dicey affair for me the knitter with millspun let alone handspun yarn. All of the ideas were good here. Handspinning win! 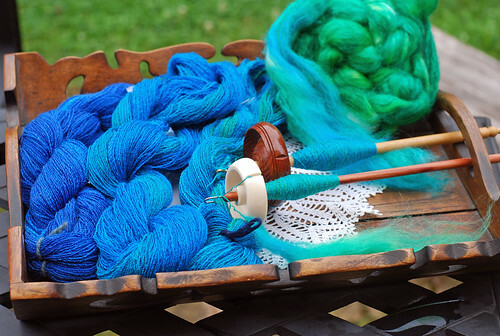 The subtle shift of the blues in Mandie’s colourway that I spun as a 3-ply yarn more than convinced me that this was a great use of my yarn. The new parents of baby E are thrilled but maybe on less geeky grounds! Knits mostly but also some handwoven for babies/ kids has spanned the last decade here. Responses are all over the map, and I found there is nothing for it but to make them when prompted to make. 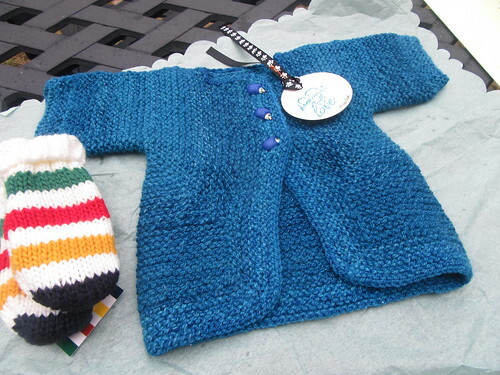 Four days of avid knitting, more to get a card + cute HBC mitts for these US-based folks, packaging, pictures together and all for a baby you wish dearly to outgrow the jacket. It’s bananas! When the parents weren’t really staying in your circle anyway (e.g. 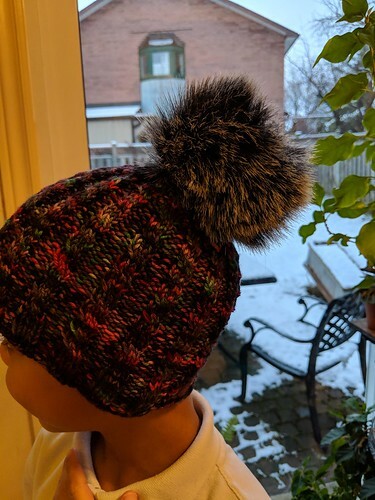 last December kid’s wool hat effort, sigh) the heart of it is that a little person has value added in the hands to use for that time of their childhood. If not lost & preserved for the memory of it as well. That’s the point. You hope for more but know it’s fleeting at best. 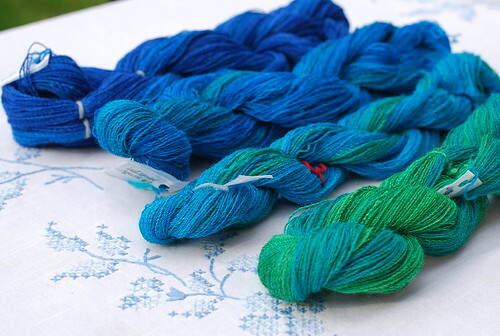 Categories: Finished & in the wide world, Natural Dyes, Stash in; Stash out | Tags: BFL wool, BFL/silk, handspun yarn, Jenkins Turkish spindle, Madder, Spinning, triangle shawl, wet blocking, Zwartables wool | Permalink. Free members with more than 1,000 photos or videos uploaded to Flickr will no longer be able to upload new content after Tuesday, January 8, 2019 unless they upgrade to Pro. After February 5, 2019, free accounts that contain over 1,000 photos or videos will have content deleted — starting from oldest to newest date uploaded — to meet the new limit. Did I want the grief of meeting the new limit? Dear readers, I did not. We upgraded and I am calling it a Christmas present to myself & my 1,422 all rights reserved photos. Not a final decision by any means but rather a step into the new year. We have a big anniversary coming… this next March, TKK turns 10 years old! Possibly the only thing that has not changed about TKK since 2009 is the intention. It’s simple really, I build posts on work done. A tidy idea with no room for affiliates, sponsors or senders of swag. Just right here in the scary & unpaid open, I put out what’s the most compelling. 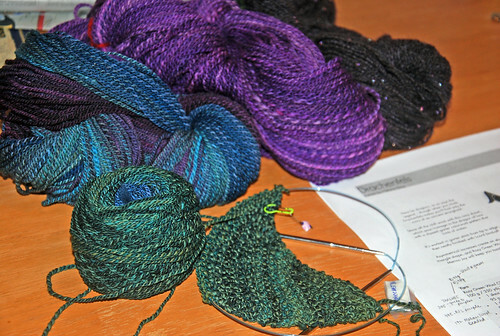 TKK is a blog about adult learning that I started as a very unlikely, very new knitter. 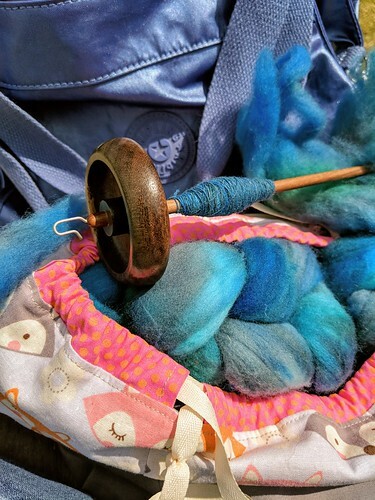 In some ways it has come full circle – I do know my way around & am less of a novice even with weaving but find myself at home in the same way that I used to be at paid employment… with less community than I would like, and frankly, stressed. The treatment of sadness is connection. Dr. Boss’ area of work is ambiguous loss, and I will be going back eagerly to hear the rest of the uncut interview. The admin news does allow TKK to go forward with the idea of connecting outside the walled craft gardens. Let’s see where it takes us. What a good feeling to have finished the Strie Cheviot wool socks this Sunday! The designer is Lara Neel. 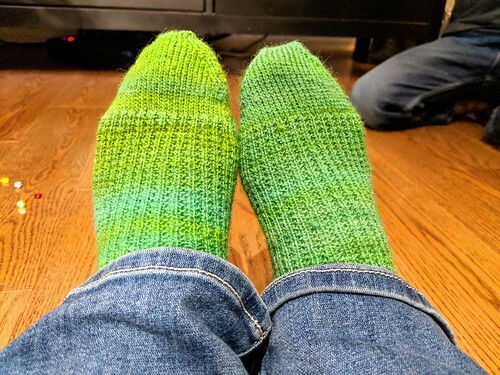 These socks were knit pretty evenly split between 2 months this fall. The foot soles are knit through the back loop (i.e. 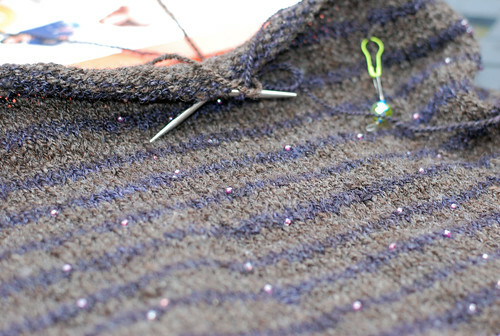 crossing the knit stitches). The 2-ply Cheviot yarn is Z-twist direction, and was slightly loose knit through the front loop. For a few rounds on the first sock, I forgot the ktbl plan. That band shows clearly in the sock – do you see the slight pucker? 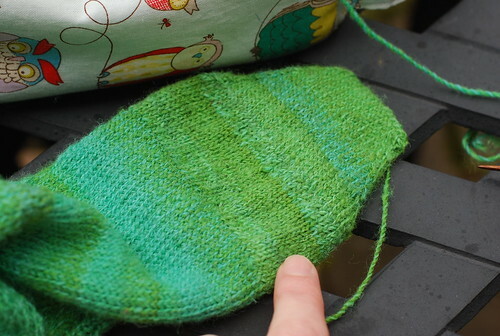 The gentle flashing in the handspun was fun to watch unfold on the needles, and I am in love with the finished socks. Wearing them has put a spring in my step! Nothing is uncomplicated about weaving a week before family visits for Christmas. If you are going to do that in the guest room then this a good kind of project to choose. 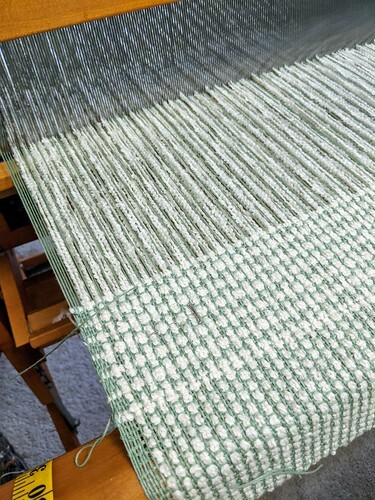 The sage 8/4 cotton is 2 ends x 2 picks plain weave, and the Monte Cristo cotton bouclé is 2 x 2 common basket weave. 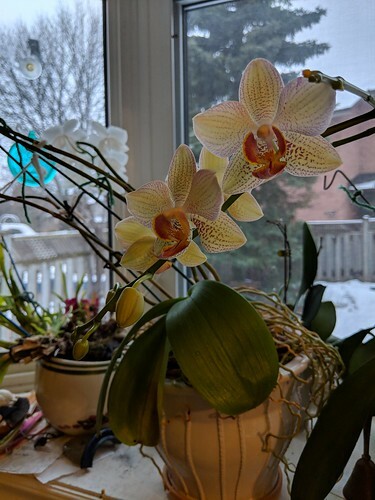 After pausing to water the orchids, yesterday morning, I sat at the loom bench as much as possible. The short warp is finished! Wow that was quick – hemmed-stitching! The basket weave took-up more than I expected over the 2.5 yard warp, and it will be a smaller size baby blanket. Good thing I am sending it home for the newborn phase! 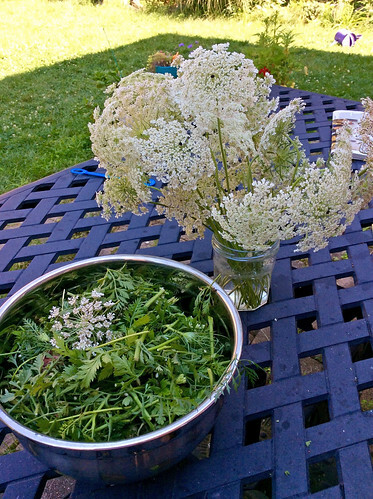 As I threw the shuttles, I had time to think both about weaving & a knitted olive branch that I mailed mid-week. 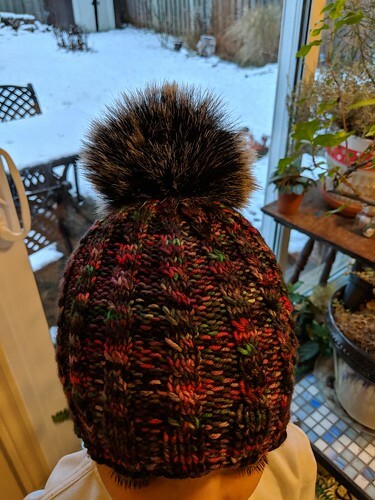 This is a 20″ circumference (small) Téamh hat designed by Jennifer Tepper Heverly for a turning-six-this-week girl. As Jennifer explains in her pattern, “téamh” is Irish Gaelic for “warming.” It’s been sent in an icing of relations, and is not her first FO off my needles. 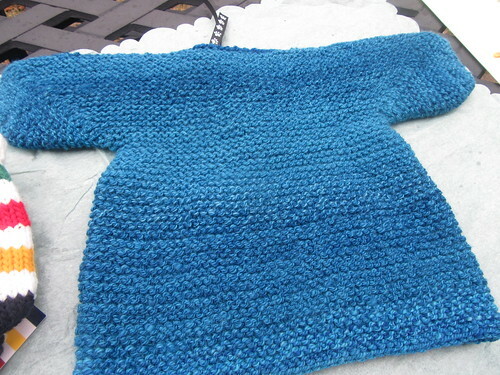 The yarn here is Cascade 220 Heathers, knit on 3.5 mm needles. One hat led to another! 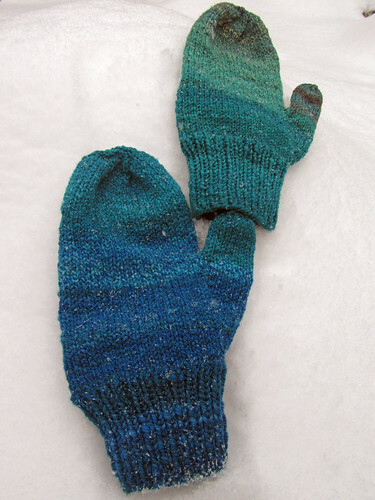 Both versions modified the pattern from a garter texture to the traditional reverse stockinette. I also kept the same needle-size for a snug fit. 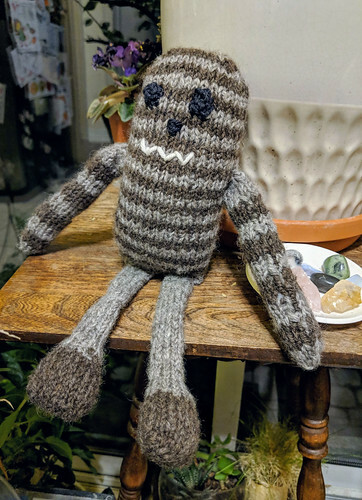 This mid-September start on a Lloyd the Tall Monster by Rebecca Danger (“Knit a Monster Nursery”, p. 57) sat in pieces for oh, a month. The yarn is my handspun BFLxShetland 3-ply knit on 3.25 mm double point needles. With craft gifts almost all given, I am hoping to work up a garment for me soon. As I sat at my loom this week, I weighed a thought. Be it resolved to weave more in 2019? That is the question. Carving time for weaving = sacrificing other more established patterns. 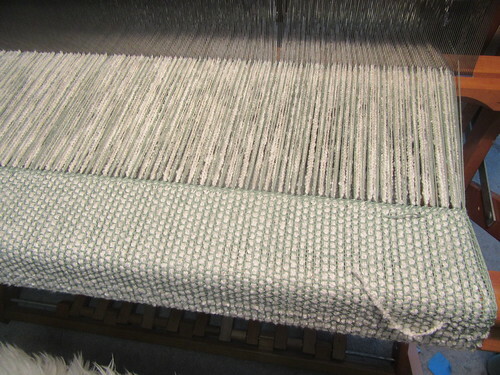 It may well be time to do that because weaving feels like a barrel of potential. Categories: Finished & in the wide world, In the Pipeline, Stash in; Stash out, Weaving | Tags: Baby blankets, Baby gift, Cheviot wool, cotton yarn, Flora, handspun yarn, Hat, Sock | Permalink. 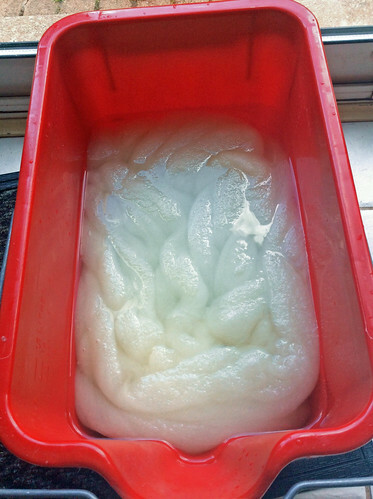 In my last post I wrote about spinning a 2nd Shetland wool top from another dyer. 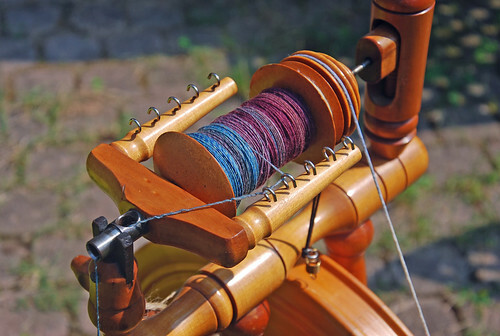 The spinning tools were the same & the process varied only very little. As I saw during spinning, yes, the yarns proved to be so, so different. Now that they are finished, I wanted to come back & compare them. 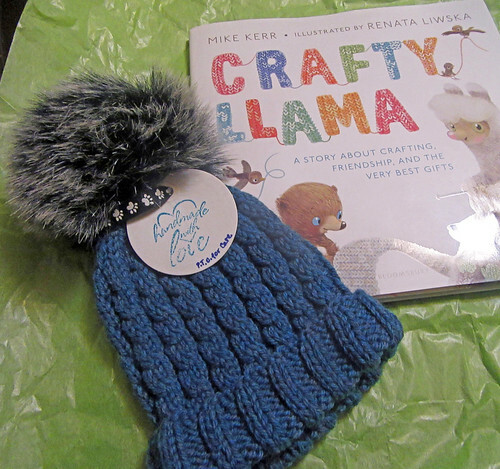 Furiosa from Sheepy Time Knits’ Female Heroes Club is on the left. 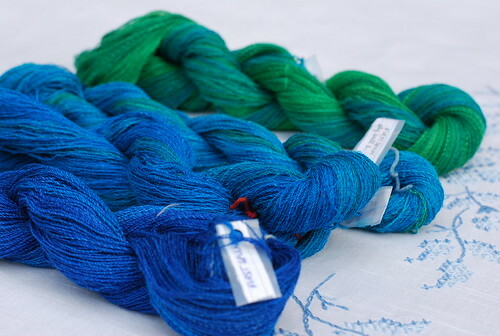 Its 2 skeins weigh 115 g, and are around 187 yards (748 yards per pound). The colourway shifted gently, and as a conventional 3-ply lilacs and reds shoot through the darker tones. There is depth to the 3-ply and the colours never muddied. I suspect that Mandie kept her painting to the length of the Shetland staples but won’t be asking her to spill her trade secrets! There was some but not very much kemp in this braid. How long to wind-off the wheel? 8 days. The Autumn Wedding from Sheepspot at Woodstock was lighter at 104 g. The handspun yarn measures around 179 yards (1,925 yards per pound). These were both quick spins, and again I didn’t analyse this fibre’s painting sequence. This braid had 4 colours in a non-repeating pattern with different lengths between the 4 colours. In other words, purple was shorter than pink, and there were strong ochre & orange runs as well. 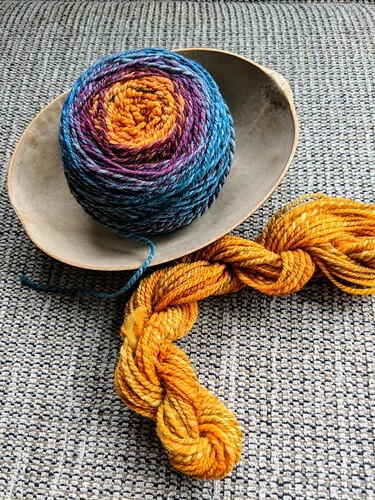 The 3-ply from this braid is also complex but with strong, warm colours. 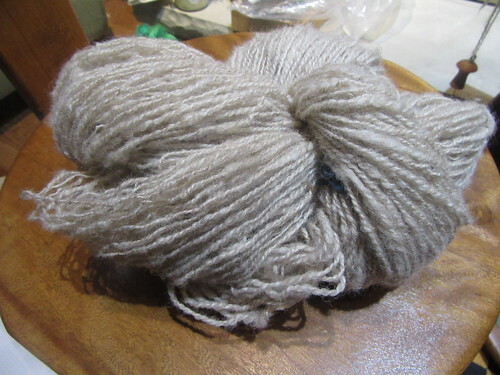 I will use this handspun in a separate project and not paired with Furiosa. There was a fair bit of kemp, and the yarn is 5 g lighter than the braid was after the picking out. How long to wind-off the wheel? 4 days. 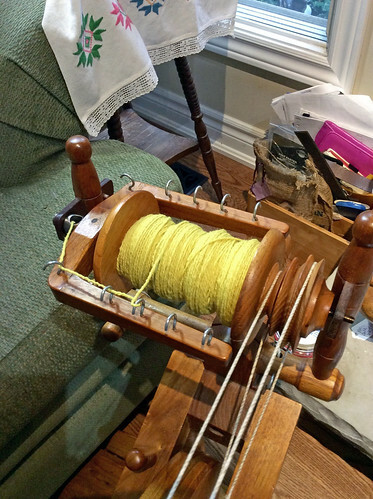 To recap the method, both braids were spun on Wee Peggy, plied on Martha (Watson) spinning wheels with the same set-ups. 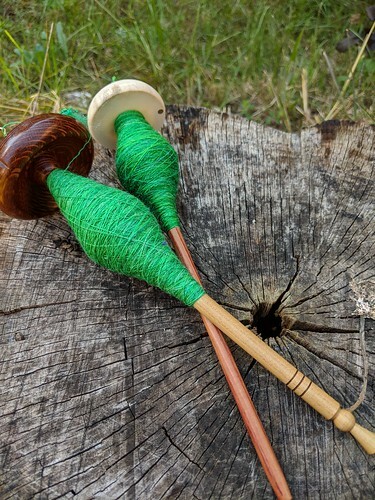 I divided each in thirds by measuring length, and fished out kemp before spinning. It was a worsted-style spin across the full width of top in the same order of thirds, 1-2-3 order. 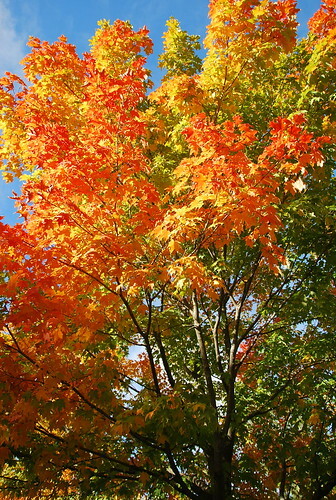 It diverged only in Autumn Wedding when the last ¹⁄3 proved heavier by approx. 11 g. How I handled that was to stop, weigh, and add the last 5 g of hot pink to the 1st bobbin. 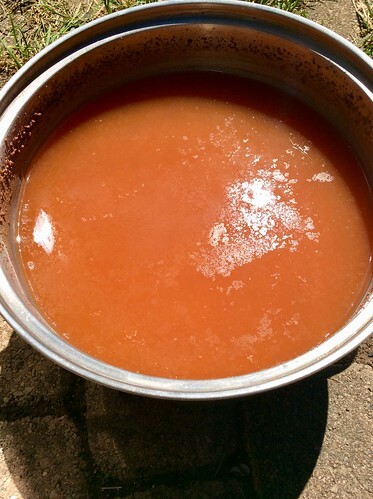 The up-shot is that last-dyed from section no. 3 walked up to section no. 1. It’s a subtle shift but gets noted as enhancing what we spinners call a barber-pole effect. It was still uneven but that’s the 2nd skein, 30 yards. a bold, warm, multicoloured version with a light sport-weight grist. 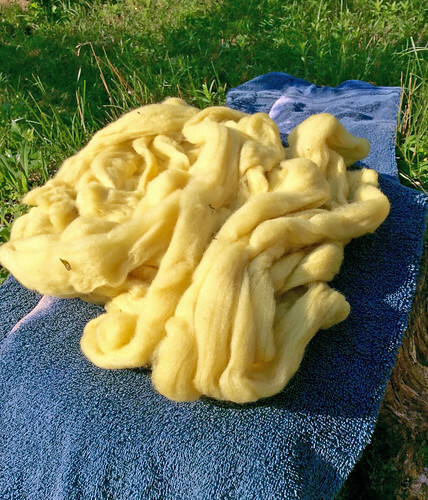 A side-note – do not pass over a mill-prepped dyed Shetland if there’s some kemp. 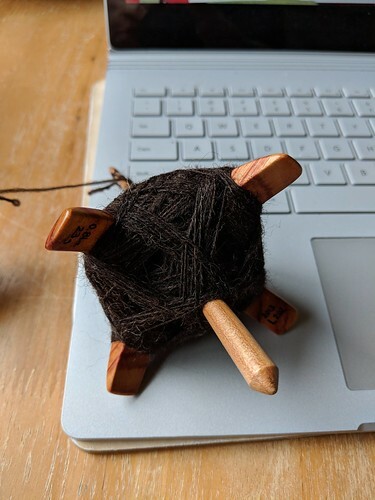 You can easily pick it out, still have a quick spin, and avoid (gah) scratchy (sometimes called rustic) handspun skeins… just ditch that kemp! 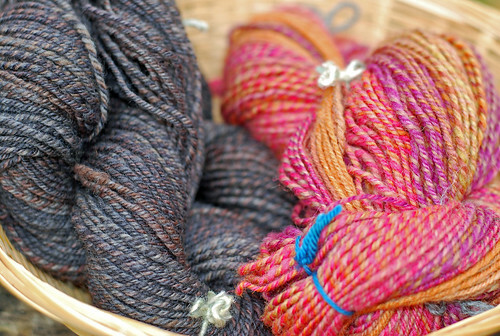 There are times when combining handspun yarns can seem like a good idea only for it to be you know, not. My winter 2017 Drachenfels shawl has the (front-to-back) Targhee, Blue Faced Leicester & I substituted a Columbia for that beaded mohair/wool skein. By fall 2017 it worked so well with Romney for my Starry Stripes Handspun Vest. The details are not important. 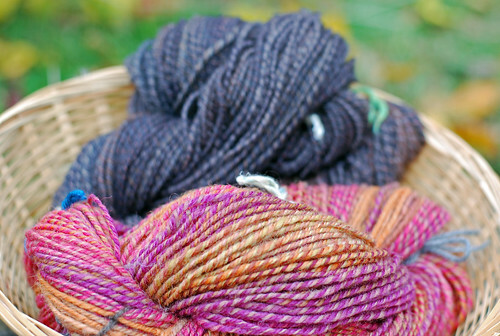 This time, I already know that these Shetland yarns may never pair well for me. That’s okay! I am already scheming for the new skeins to be Pierogi Slipper Socks by Sarah Jordan and/or a tea cosy. 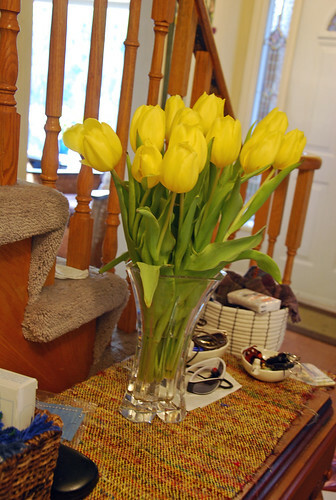 Both feet & steeped tea cry out for these warm, cheerful colours! For now the 2 wheels are staying empty for a bit. Not only am I still knitting the 2 handspun projects but there’s a nicely developed warp plan for Swedish lace 2-tone napkins to grace our home. 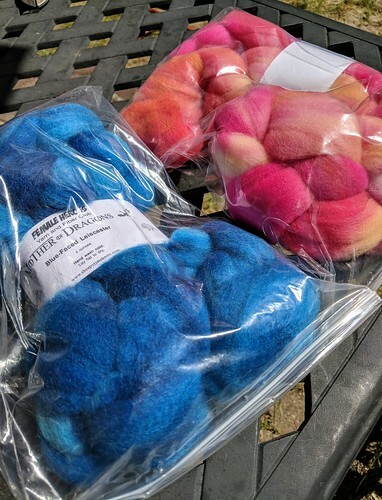 Categories: Finished & in the wide world, Spinning, Stash in; Stash out | Tags: handspun yarn, Materials, Romney wool, Shawl, Shetland wool, Spinning, vest | Permalink.